Born in Mexico City on November 22, 1914. He began his professional and self development in 1953, having dabbled in music, painting and life have earned as a taxi driver. Since 1957 he devoted himself to public sculpture. He worked about 20 works in this order: Portraits of heroes to Mexico City, Durango, Gomez Palacio, Lerdo City, Villa Hermosa, Cardenas City, Montreal, Canada and Universal City in California. 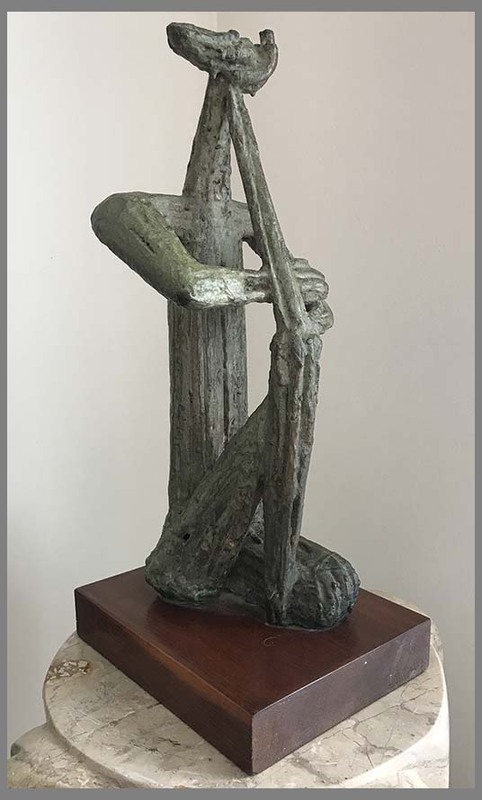 The works that made the sculptor Augusto Escobedo in the city of Villahermosa and Cardenas in the southern state of Tabasco, for the period in which he devoted himself more to public art, as art critic Raquel Tibol. He was represented by Galeria Tasende in the 1960’s, one of the most prodigious sculpture galleries in the world. The self - initiation of Escobedo reached its apogee in 1956 with a brilliant activity that included the development of national heroes. However, this apogee not constitute the height of his career as a sculptor since the early seventies he bust himself through abstract and sensual pieces, onyx and marble. Mexican cities like Gomez Palacio and Lerdo, Durango; or foreign cities like Kansas City, have parts made by his hand, bronze or stone. "It was a man who was always very active, but then took refuge in Cuernavaca and we did not have much presence, at least in the galleries, but continued working intensively and interesting way , " says the art specialist and author of monographs on Diego Rivera, Jose Clemente Orozco and David Alfaro Siqueiros, among others. In the Tabasco state capital and in the city of Cardenas, belonging to the same state, Escobedo rose six sculptures corresponding to the first time he devoted himself almost entirely to civic works. Most of these may well enter what Germán Rubiano Caballero points out in his book The sculpture in Latin America on the work of some disciples of the sculptor Francisco Zuniga, among which includes Escobedo: "outside history and politics Sculptures, but within the rules of nationalism. " The source naughty children; The athlete; Zapateado; the Fountain of the fishermen and the horse Gregorio Mendez, were opened during the period of Governor Carlos A. Madrazo Becerra (1959-1964), which drove much work tabaqueña Escobedo in the capital. He also made the sculpture of Don Jose Eduardo Cardenas, at the intersection of that city with Comalcalco and tabaqueña capital. Of the five sculptural bodies, only two do not retain their original location: The Source of Fishermen, who was first avenue and José Pagés Ruiz Cortines Llergo, before being transferred to the call Revolution Square in Tabasco 2000; and the equestrian statue of El Caballito, dedicated to nineteenth - century hero who fought against the French, Colonel Gregorio Mendez, which was placed initially at the intersection of Avenida Paseo Tabasco and February 27, before dominating the intersection of Gregory Mendez and 27 February. "The reasons for removal were due to entropecían the road , " recalls the architect Victor Manuel de Dios Olán, author of an unpublished research on the architectural space of the city. God Olán also recalls that in the eighties, the sculptor Escobedo again visited Villahermosa, and he took the opportunity to ask him about "some inaccuracies" he had made in the representation of tabaqueño hero, what Escobedo merely said "that he followed the instructions of then governor Carlos A. Madrazo Becerra ". Vernacular theme of his sculptures is found in the Fountain of Fishermen, which recreates the effort of four men to remove their nets from the water, where cavort generous sailfish, illustrating not only the struggle for life but also the work of man team (some local critics complain that their animals do not correspond to the fauna of the region, but if it is a work of art, you may be asked exactly?). At the source of naughty children, the subject is childhood and harmony with nature, enjoyment representing eleven children to enjoy the water and the flying creatures. A very common sight in his sculptural representations about at that time (in 1960, donated to the Youth Center Frisco, Texas, sculpture Sisters, where two naughty girls play with water). More vernacular is the pair of dancers dressed in their typical clothes in the sculpture Zapateado. The sensuality of the body in its effort to obtain food from the sea or simply to victory shines through in The athlete and the source of fishermen. In this regard, Raquel Tibol confirms: "I had a lot of sensuality in the treatment of forms and invented a sculptural way elsewhere is but in Mexico he was of the few in work it, which was to elaborate sculptures that was not enough to see out, you had to put your hand, as it were penetrable sculptures, palpándolas forms were discovered, but it was necessary irlas playing ". The parts of the hands, feet and buttocks of infants in the Fountain of Naughty children are hidden in the water, as if also invited to reach into the liquid. 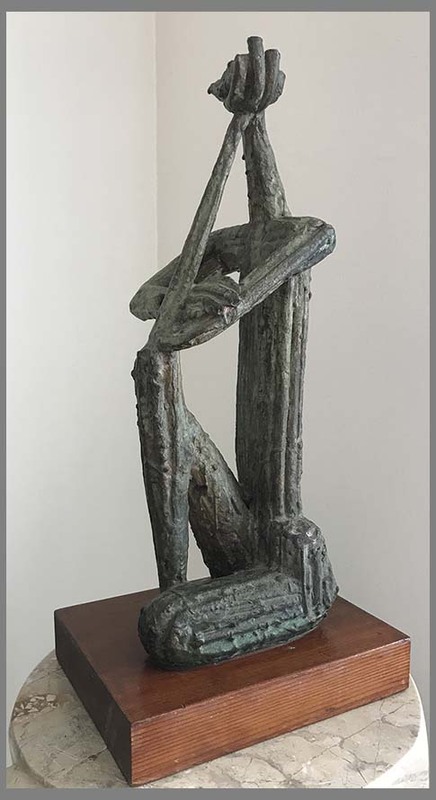 "It 's a sculptor who long not been mentioned again, that deserves a review of its work because it is very creative, not only in the figurative with popular characters, but of lyrical abstraction, very sensual character and even I would say sexualized "he concludes. If it is true that there are works that become part of the landscape, integrating into it so that there is no difference, as proposed by the Sebastián sculptor undoubtedly the Source of naughty children it is the closest to this collective history and the imaginary villahermosinos.